The story’s words and art invite you in, and ask you to simply observe. This close look reveals nature’s ability to adapt, evolve, survive, and thrive. By the end, you can’t help but root for these little fighters! Carolyn Fisher’s painterly collage artwork is a perfect pairing for this text — it zooms in and out and all around, showing many angles and viewpoints in a way which beautifully visualizes the journey the story takes. 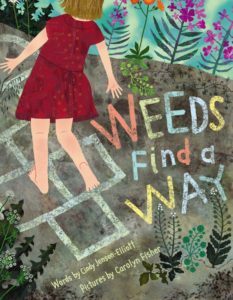 The book ends with a wonderful author’s note “Meet The Weeds”, with more detailed information about what weeds are and how they function, and introduces the reader to a range of different weed plants. What I loved the most about this book was that it broke down my inherited judgments, and replaced them with curiosity, wonder, and admiration. Carolyn Fisher, Cindy Jenson-Elliott, Eliza Wheeler, Weeds Find A Way. Bookmark. A fresh new idea wins every time! I going out to search for me fresh new weed idea! I agree, Terri! “A fresh new weed idea” — love that. I love this book! Who knew you could make weeds beautiful, but this book does. . . .
Just goes to show you good writers can write on any subject. True artistry! I agree, Kris — who would have ever thought weeds could feel this magical? This is beautiful on so many levels. The art, language, and info do pull you in. What a wonderful idea for a book. Maybe now I can quit pulling weeds and just enjoy them! What a lovely concept! Congrats! Especially lovely because most kids don’t need to distinguish between a weed and a cultivated plant or flower. It is green and grows, thus it is beautiful! Oh, my! What a gorgeous book! I can picture teachers reading and discussing this in their classrooms. I think I need to read this so I can have a better attitude when I’m weeding in the garden. It looks lovely! This is one of my very favorite books, Eliza. 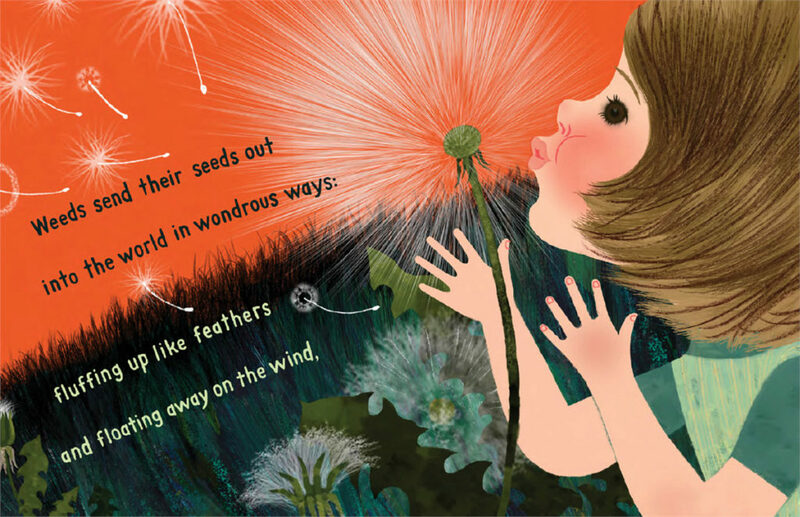 The words are lush and lyrical, and the art suits them perfectly! And the 3rd quote you included is my very favorite from the book! Thanks for sharing it! Thanks so much for suggesting it, Maria! It was a great find that had to be shared. Thank you for sharing. I garden and find it hard to pull weeds, sometimes. They work so hard to live and thrive. I love this book! Thank you for sharing it with others. Love this one! Every time I pull weeds in my yard, I say to myself, “Weeds find a way!” Thanks for sharing. Thank you for sharing this beautiful book. I love the words! The pictures are absolutely breathtaking. Even though I’m always busy pulling weeds during the summer, it relaxes me as I enjoy contributing to the growth of the flowers and vegetables that I plant. Weeds are amazing when you see them grow in the tiny cracks of rocks. I wish my plantings would do the same. That’s so sweet to hear Dorothy — it sounds like you have found a way to appreciate weeds as a gardener! I hope to have a garden someday, and have the same attitude that you (and this book) do. That’s a great idea, Judy! Love the lyrical language! Will have to see this one. 🙂 Thanks, Eliza. 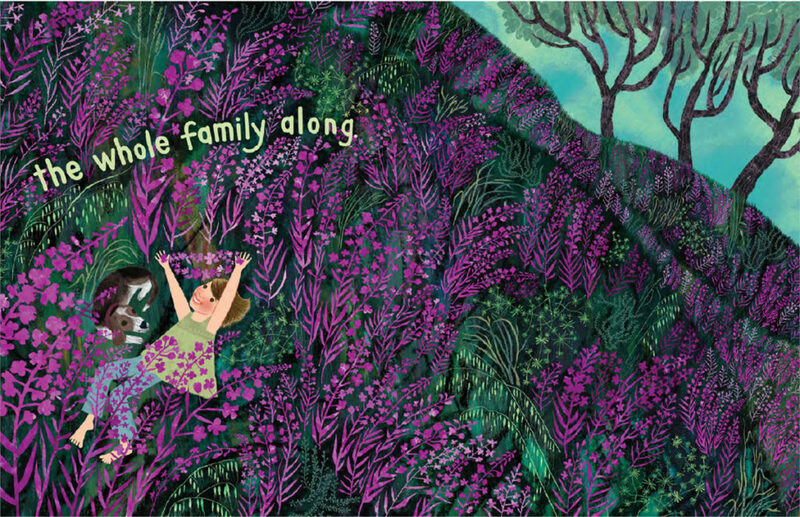 The colors in these illustrations are so brilliant. They are amazing. 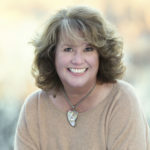 Thank you SO much to everyone for reading and commenting!